Service providers seek to be the owner of the broadband home and the subscriber relationship. Future gateway devices should provide a primary control point, enable value-added services, facilitate improved support, and leverage the benefits of a wireless home environment. Today‘s connected home is a place of active change—a complex environment of devices, services, content, and data. The perceived line between data and video services is increasingly blurred. 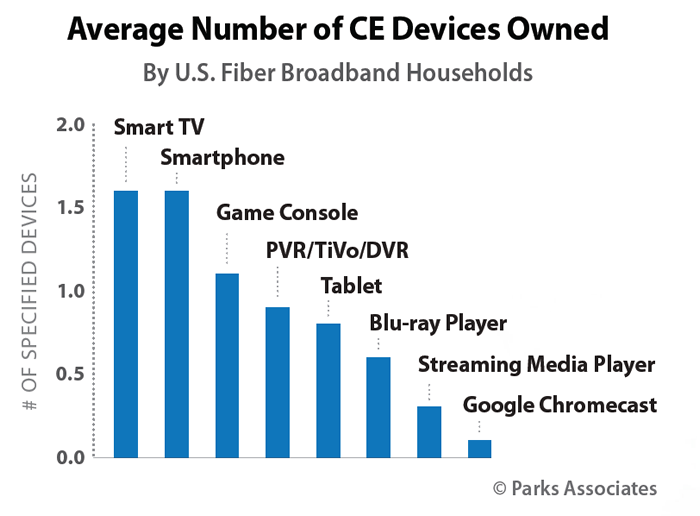 Internet-connected CE devices consume video and data in unprecedented volumes across wired and wireless networks. New devices such as the tablet, streaming media players, and the Chromecast are quickly gaining acceptance by consumers. Homes with fiber-based services are particularly complex, with an average number of 7 connectable devices per home, 10% more than in average U.S. broadband households. The high-speed broadband environment in these fiber-supplied homes is enabling new consumer habits and encouraging adoption of even more connectable devices. While multiscreen video accounts for a substantial share of high-speed broadband traffic, data consumption is also increasing for cloud-based services and features such as VoIP, videoconferencing, cloud storage and applications, and others. For the IPTV environment in particular, the managed service gateway has emerged as a tool to help operators and their customers successfully cope with the ever-changing connected home. Today’s telco operators are assessing the features necessary for managed services gateways that will serve tomorrow’s subscribers. Current market and technology trends suggest several priorities that operators should consider as they plan their requirements. Thin client devices will be common. The introduction of whole-home DVR functionality and interconnected CPE devices opened the door to new thinking in residential device architecture. Delivering functionality from the managed network or gateway device to client set-top boxes allowed operators to potentially realize substantial cost savings by reducing costly components in the client devices. Eliminating local storage, a high-cost component that was also a common point of failure in set-top boxes, was particularly beneficial. However, other functions could be shifted as well, including the program guide, tuners, discovery tools, or conditional access for IPTV services. For video services, this change also allowed the client set-top box to potentially have a longer effective life, relying on virtualized features rather than being limited to its own resources. Many operators now envision a future where much of the consumer-facing functionality in the home will be virtualized. In some cases, set-top boxes could be eliminated completely. Moreover, virtualization will not stop at the set-top box. Key features of home automation, energy management, home security, and digital health can also be virtualized, minimizing the costs for in-home devices to support those services. Gateways themselves will ultimately leverage virtualized network management features, expanding their capabilities and extending their effective life. QOS and traffic prioritization will be important. Tomorrow’s broadband services will be competing at gigabit rather than megabit speeds. Swisscom has offered 1 Gbps service since late 2013. Japanese ISP So-net offers a 2 Gbps service. In the U.S. market, Google’s entry into the FTTH broadband services arena has spurred AT&T, CenturyLink, Cox Communications, and other operators to compete at gigabit speeds. Dozens of operators and several municipalities now offer gigabit speeds, and fiber optic services are a key element in that growth. Eventually, throughput speed begins to be a less critical differentiator as consumers are less able to perceive differences among various speed-based tiers of service. Instead, consumers will look to their actual experiences online, such as interruptions in watching online video, in order to evaluate broadband service quality. Latency and performance could help providers stand apart from competitors. In fact, broadband pricing or operator business models may rely on performance differences, with operators charging higher speeds for “enhanced” broadband services. Intelligent traffic prioritization will be a key element of this type of “enhanced” broadband service. Personalization and flexibility could also be differentiators, for example, allowing consumers to set their own traffic priorities or setting time restrictions on when children can be online. A master control point that has insight into all aspects of data use in the home will be needed in order to optimize the flow of household data traffic. An in-home control point will provide operators with a market advantage. Such a control point will provide advantages beyond traffic management. In tomorrow’s competitive market, companies are regularly emerging that seek access to the consumer and data regarding video viewing and data use within the home. Ad networks, online services, retailers, manufacturers, and other players currently use website cookies, apps, device interfaces, service offerings, or other means to establish access to consumers. Companies including Amazon and Google now offer in-home devices that provide them with superior access to consumers. By increasing the capabilities of these devices, these players can establish in-home platforms for services that will compete directly with operators. By maintaining a central control point within the home, operators can both maintain their position as a trusted provider and establish a platform for new services. Incremental revenues will drive functionality. As broadband markets and pay-TV services become more competitive, providing downward pressure on pricing, new revenue opportunities will be vital to the bottom line. Many are enhancing their video services as a path to new revenues. Second-screen capabilities, improved discovery, and better merchandising of on-demand content can provide additional advertising and transactional revenues. Smart home services, including premises security and home automation and control, are among the most popular trends in value-added services being considered by operators today. Broadband providers are also experimenting with a variety of additional services, including videoconferencing, online storage, online gaming, music, digital health, and other services. Those that successfully introduce these services will enjoy a higher ARPU in the market, allowing them to pull further away from their competitors. Managed services gateways must have the appropriate hardware and software resources to enable these services, including processing power, storage, and memory as well as service-specific capabilities like home automation connectivity or DLNA support. While gateways will leverage the operator network for virtualized features, some functions will need to remain local, including diagnostics, connectivity, and security. Operators will offer a variety of services. No single value-added service is likely to have universal appeal. Rather, subscribers will select subsets of value-added services from the menu of services offered by operators. As a result, gateways must support a wide variety of value-added services. However, operators cannot support every possible type of service and maintain a measure of cost control over the gateway. Ultimately, operators must make strategic decisions as to those services most likely to find market success within their unique territories and establish requirements for a gateway that enables those services. Although operators will carefully plan their services and in-home systems for the future, service popularity and technology will change over time. Operators will need the ability to introduce new services or to enhance current service features without replacing the existing gateway or requiring site visits. Perhaps as critical will be the ability to pivot business models, pricing, or service parameters in order to outmaneuver direct competitors or new alternatives. Virtualization of features and a software architecture that allows remote, dynamic updates can provide such flexibility. Both of these approaches allow operators to quickly introduce new services or make changes to existing services overnight and to the entire subscriber base at one time. Bug fixes or other issues can also be addressed promptly and deployed immediately, thus reducing the risk in introducing innovations and minimizing potential downtime. Wireless connections to the TV will be an essential feature. For several years, technology companies and pay-TV providers experimented with ways to deliver content to set-top boxes wirelessly via Wi-Fi or other technologies. Over the past few years companies throughout the industry such as Quantenna have continued to innovate in video-over-Wi-Fi, refining 802.11n systems and collaborating to create a new 802.11ac standard to specifically handle the demands of a pay-TV environment. The primary challenge is in providing a reliable, sustained wireless signal that can deliver HD video with good quality throughout the home and without interruption. New 802.11ac technologies such as MIMO (Multiple-In Multiple-Out), DFS (dynamic frequency selection), and beam forming not only provide superior bandwidth but also greater coverage in the home, even in markets such as Europe where home construction makes reliable use of Wi-Fi problematic. Operators can now leverage these new 802.11ac technologies to make Wi-Fi a ubiquitous delivery mechanism throughout the home. In 2011, U.S. telco AT&T launched a set-top box that used a Wi-Fi connection to connect to the home router. Subscribers appreciated the freedom to move the television anywhere within the reach of the technology in the home, and demand for the service grew beyond initial expectations. Within a few years, Bell Canada, CenturyLink, Swisscom, Telefónica, and others had introduced their own wireless set-top boxes. Wireless set-top boxes will begin as a differentiator before eventually becoming a must have for pay-TV providers. The greater flexibility and convenience of these devices will make them a popular offering among subscribers. Video delivery to connected devices will be expected. In addition to wireless connections to the TV, consumers will grow to expect TV content to be accessible on any wired or wireless screen in the home. Today, awareness of TV Everywhere functionality is relatively low, even among subscribers who have access to the service. In the U.S. market, only about one-quarter of consumers that have access to TV Everywhere are aware that they receive the feature. Over time, awareness and use of this free service will increase as pay-TV operators seek to stay relevant to younger consumer segments that watch significant amounts of video on computers, tablets, or smartphones. Tomorrow’s gateway devices will include content delivery capabilities to enable access to on-demand and linear content on connected devices, including HD content today and 4k UltraHD content in the future. Content protection technology, cloud-based user interfaces, and the ability to host and serve content will all be necessary in order to provide the secure, anytime-anywhere experience that content partners will allow and that consumers will expect. Wireless devices will significantly improve installations. Installation costs and experiences are key considerations for any operator and are areas directly impacted by a managed services gateway. Gateways that support wireless set-top boxes minimize the amount of drilling, wiring, and other physical changes to the subscriber’s home. Because installers need not run new cabling into the home, installation times are shortened substantially. IPTV providers particularly benefit. Fiber-to-the-home installations are often more time consuming than installation for cable or even satellite-based services. IPTV distribution may require complete CAT-5 re-cabling of the home. Even in circumstances where technologies like HPNA are used to leverage existing home infrastructure like coaxial cable, IPTV requires unique tools and training for installation and is less flexible or forgiving. On their websites, U.S. providers claim average IPTV installation times ranging from three to six hours, depending upon the CPE involved and the number of rooms. Eliminating in-home wiring could potentially reduce installation time by two to three hours—potentially cutting installation costs in half. This translates into a per-installation cost savings of $110 to $160. For a fiber operator installing ten thousand homes in a year, the cost savings over the course of a year will reach $1.1 to $1.6 million. In a high-growth market with a strong volume of net adds, annual savings will be even more substantial. For consumers, shorter installation and lead times translate into less inconvenience and a perception that the operator is quick and efficient—factors which can positively affect subscriber satisfaction. For operators, shorter installation times affect the bottom line. Operators are able to activate more new subscribers in a shorter period of time without increasing the volume of installation personnel, effectively accelerating time-to-revenue for new subscribers. Over the course of the year, the additional revenues generated among those ten thousand homes reach approximately $3.8 million annually, simply by accelerating the volume of installations. Alternatively, operators can serve the same volume of new subscribers but with a smaller installation force. The reach of the gateway’s wireless network is also an important design consideration that impacts installation. If the gateway’s Wi-Fi signal cannot adequately cover the entire home, installers are forced to address uncovered areas with wiring or other solutions. Furthermore, if the consumer chooses to move the wireless set-top box to a spot inside or outside of the home that is beyond the gateway’s reach, the operator is likely to get a support call and, perhaps, a dissatisfied customer, potentially resulting in additional truck rolls. Wireless design aspects for the gateway, including use of 802.11ac, the number of antennae, and technologies such as MIMO, DFS, beam forming, and use of the 5 GHz spectrum range, can extend its reach and effectiveness. They can also produce an entirely new installation model for IPTV service providers. Offloading mobile traffic will be increasingly critical. Consumers today actively use Wi-Fi connections to shift mobile traffic to wired networks whenever possible in order to minimize mobile data use and out-of-pocket mobile bills. The increased use of video and other bandwidth-hungry applications on mobile devices will continue, further encouraging consumers to leverage connections to wired networks. Mobile operators, particularly multiplay service providers, will similarly want to make use of mobile backhaul opportunities via wired networks whenever possible in order to minimize traffic on the mobile spectrum. Managed service gateways will include specialized features to actively connect to consumer mobile devices and to provide seamless network handoffs in order to offload traffic wherever possible. This activity, along with the future use of wireless set-top boxes, will increase Wi-Fi-related traffic within homes, forcing continued innovation in Wi-Fi network technologies. Because operators will have an incentive to add improved offloading of cellular data and improved Wi-Fi features, operator-provided Wi-Fi is likely to outpace consumer-purchased Wi-Fi network equipment in many markets. In-home visibility will facilitate superior support. For operators, keeping the connected home running smoothly will become an increasingly difficult task. 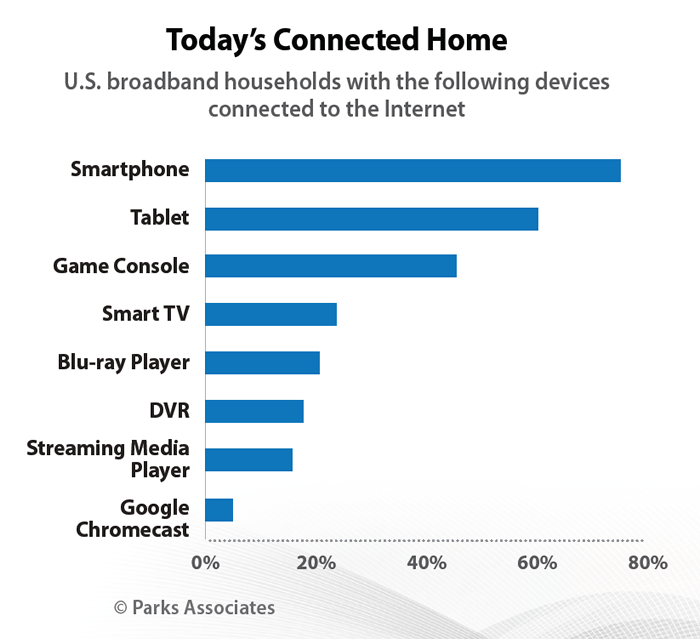 Consumers will continue to connect a diversity of disparate products to the home network. In many cases, these products will leverage cloud-based services or downloaded apps that will enhance features, change the base functionality, or introduce new use cases for the product. The future connected home will have blended wireless and wireline networks, with services and devices that will rely on both. Every connected home will be unique and will encounter unique technology and performance issues. TR-069 functionality is essential, providing operators with a look into the home network that CE makers or web services companies cannot match. Beyond TR-069, future gateways must provide operators with nuanced insight into the home network, network activities, and the devices that are connected. Virtual services or complementary software to TR-069 will need to assess performance and quality of service throughout the network and to each device on the home network. The blend of wireless and wireline network use within the home will require unified insight into and management of all networks and connections within the home. The value of virtualized features and dynamic software updates applies to support as well. Cloud-based services can be continuously updated for any new connected consumer devices that are introduced in the market or, more significantly, into the consumer home. Gateway software and virtualized features can be updated to accommodate these products, minimizing subscriber frustrations and support calls. Beyond just customer support, this expanded visibility can be leveraged for entirely new levels of support and new “managed home” services opportunities. Monitoring and preventative support will address problems early and proactively. Insight into the home network environment will be an important start, but future gateways must be able to proactively address technical issues, potentially heading off a support call before it happens. Proactive or preventative support will include ongoing monitoring of device and network status to detect network interruptions or disconnects, latency problems, security issues, device connections, and other areas of connectivity or function. Software tools will act upon issues before they become consumer-facing problems and can intelligently alert the broadband provider or consumer when intervention is necessary. In the event that a consumer does call, these tools will have the necessary data and diagnostics ready for the agent, minimizing call time. Whole-home security & parental controls will be a powerful value-added service. Protecting one’s family from online threats or unwanted content will be an increasingly difficult challenge for subscribers in the future. Computer viruses and malicious hacker activities are more prevalent today than ever, and consumers can unknowingly invite intrusion by simply clicking on a website link or opening an e-mail. Broadband providers need subscribers to feel safe online in order to incent them to ever higher tiers of service. Maintaining parental control over unwelcome content will also be a challenge. Various computing and CE devices have their own parental control interfaces, forcing users to set each separately. Some connected devices have no parental controls at all. Some online services or web services offer parental controls for a browser or their own experiences, yet those controls do not address all apps or online destinations. Furthermore, young consumers are often tech savvy and able to use guest devices or other means to bypass security and content protections. Managed services gateways will need to protect home networks from these risks but also provide an interactive UI that is easy to use and understandable by everyday consumers. Future gateways will unify parental controls, content filtering, and other protections for the entire home, providing parents with a single point for addressing risks on all devices in the home and supplying alerts regarding unwarranted activity. Gateways can also leverage cloud-based services to enhance or extend this service protection. For example, cloud-based services can allow subscribers to access and modify parental controls or other security features at any time and from any location, inside or outside of the home. A combination of the in-home presence of a gateway device and the reach of cloud-based features provides unique protection for families and can be leveraged for applications beyond security. In addition to the improved presence and services, potential cost reductions, and opportunities for incremental revenues, tomorrow’s managed services gateways can be a tool to retain and grow the relationship with the subscriber. Moving forward, data will be an increasingly precious commodity, leveraged by innovative companies to provide personalized services to consumers. Tomorrow’s managed services gateways will deliver such data to operators, allowing them to offer upgrades and premium services to those consumers who most need them. By enhancing the support, services, and experiences delivered to consumers, tomorrow’s gateway will help operators maintain and strengthen their position as the subscriber’s trusted provider.